The intersection of insurance regulation and trade agreements is of obvious significance to international competitiveness and, thereby, to national welfare. Yet until this masterful study the subject has remained virtually unexplored. 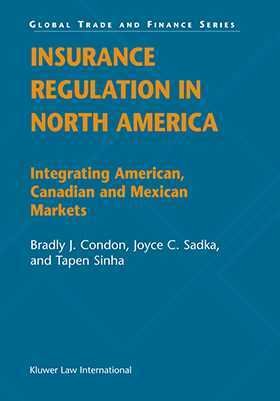 Insurance Regulation in North America, far from merely addressing this important area of theory and practice, superbly balances a world of detailed analysis and commentary with deeply insightful interpretation and debate. The book¿s focus on insurance regulation in three countries allows the authors to approach the subject in an extraordinary depth that could not be achieved in a more global account. description of dispute settlement procedures between governments. Although important issues arising in each of the three countries are all covered, there is an emphasis on the Mexican market in recognition of Mexico¿s greater future growth potential and of the relative paucity of relevant literature in English. Major case studies that reveal processes of compliance or conflict are analyzed in detail. For insurance professionals¿lawyers, business executives, and policymakers¿who want to understand what international trade agreements contain, how they work, and how they affect domestic insurance regulation and business strategy in what is rapidly becoming a global market for insurance and other financial services, this book is a gold mine. Scholars and academics in insurance law and international economic law will also find here a fresh new treatise of great significance. The Political Economy of North American Regulation. An Overview of Insurance in North America. International Agreements Regulating Insurance Services. Domestic Laws and Regulations in North America.